John Gorton became Australia's 19th prime minister when the Liberal Party elected him leader after the disappearance of Harold Holt while swimming at Cheviot Beach in Portsea, Victoria. 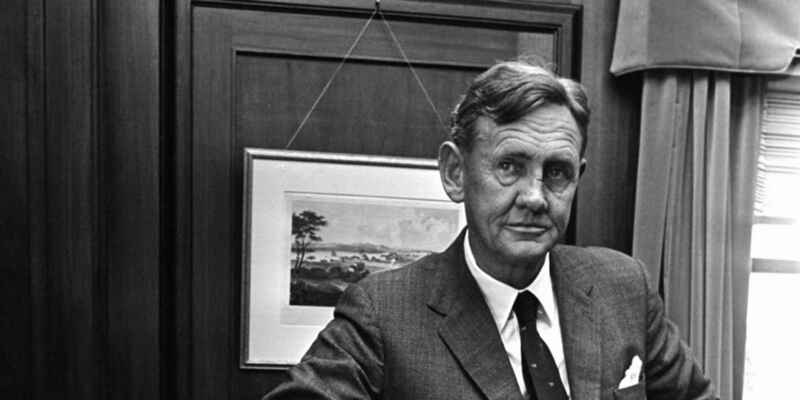 Perhaps more than any other prime minister, John Gorton was himself in office. He came to the job with the support of the backbenchers, more than the ministry, and continued to live up to his reputation as a 'mischief maker.' His personal popularity with voters was not enough to offset discontent with his leadership style in the parliament. At the outbreak of the Second World War, John Gorton joined the Royal Australian Air Force. He was discharged from service in 1944 having survived a number of close calls, including a crash which left him with severe facial injuries. After leaving the Country Party and joining the Liberal Party, Gorton stood unsuccessfully for a Victorian upper house seat, but then won a Senate seat in the 1949 federal election. Gorton spent eight years as a backbencher before being appointed Minister for Navy in 1958. He later held portfolios including Minister for Works and Minister for Education and Science. In October 1967 Gorton was government leader in the Senate. Following Holt’s disappearance, Gorton was sworn in as prime minister just one day after being elected Liberal leader. At that time he was not the obvious heir apparent to Holt, not well-known by the general public and not even in the House of Representatives. In 1971 Gorton lost the Liberal leadership and the prime ministership to Billy McMahon and in 1975 he left the Liberal Party, and then the Parliament, after standing unsuccessfully as an independent candidate for the Senate. For a number of years he hosted a popular radio program titled ‘Sir John Gorton’s viewpoint’ which was shared with over 80 stations across Australia. Australia's first Copyright Act is passed in 1968 and enters into force the following year. The Drought Bonds Act is passed on 27 September 1969 with the aim of assisting primary producers to offset losses during periods of drought. On 1 March 1970 the Indian Pacific rail service begins taking passengers from coast to coast between Sydney and Perth. Two Royal Commissions are appointed by the Australian Government, and the Queensland Government, to assess risks and benefits of petroleum exploration and drilling in the Great Barrier Reef area. Legislation to establish the Australian Industry Development Corporation (AIDC) is passed on 10 June 1970 and has as its aim the achievement of greater industry competitiveness and efficiency. The Australian Film Development Corporation Act passed on 17 June 1970 established an organisation to make Australian cinema and television and encourage their distribution. The Australian National Botanic Gardens in Canberra are officially opened on 20 October 1970. The gardens are the largest living collection of Australian native flora and carry out research into, and cultivate, native plants that are threatened in the wild. In Gorton's typical relaxed style, on his first day in the House of Representatives, after taking the oath and shaking hands with Gough Whitlam, he sat down and began doodling on a pad. There was hope amongst his colleagues that Gorton would be something different, a strong personality and a match for the increasingly confident Opposition Leader. However, in the federal election held on 25 October 1969, much of the substantial majority that the Liberal Party had secured in the previous election was lost. The government also performed poorly in the half-Senate election in late 1970, where the Democratic Labor Party gained three seats and two Independents were elected. Gorton strongly believed that national government should advance national policy initiatives and this was reflected in his legislative agenda. Gorton sought to boost Australian industry and limit foreign takeovers of Australian companies, and asserted Commonwealth sovereignty over offshore waters. Gorton's unconventional policy initiatives, including his approach to federalism, challenged traditional Liberal orthodoxy and troubled many in the Government. In an interview with the ABC on 22 January 1968 Gorton said, 'the prime minister... should put to the Cabinet or the committee what he believes ought to be done, and if he believes strongly enough that it ought to be done, then it must be done.' Gorton's views on leadership were cause for some early collective anxiety within the party. This was followed by Gorton's decision to appoint Ainsley Gotto as his Principal Private Secretary. A number of senior ministers soon became concerned by Gorton's reliance on her advice, and her inexperience; she was 22 when appointed to the job. Gorton encountered further criticism over his private life and what some perceived as behaviour unbecoming for a prime minister. Gorton's poor showing in the 1969 election led to a leadership challenge on 7 November 1969, which he survived. With a party clearly divided, the next leadership challenge against Gorton appeared inevitable. It came early in 1971, precipitated by the resignation of Malcolm Fraser for what he saw as disloyalty from Gorton. A vote of no confidence in Gorton was called on 10 March 1971, and after the tied vote Gorton stood aside and declared the leadership vacant. 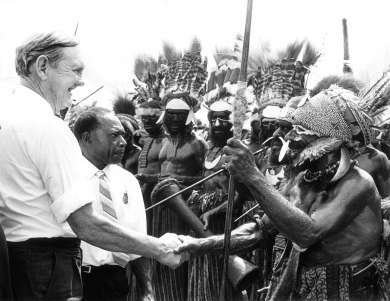 Papers of Sir John Gorton, 1959-2003. In his 1969 election campaign speech Gorton announced that ‘the time for this nation to enter the atomic age has now arrived’ and proposed the construction of a nuclear power plant at Jervis Bay on the New South Wales south coast. This was not a belief that Gorton had come to recently; in a 1957 Senate debate he argued that Australia should consider ‘some measure of atomic or hydrogen defence.’ Gorton had a keen ally for his nuclear ambitions in Philip Baxter, chairman of the Australian Atomic Energy Commission (AAEC). Baxter was a formidable proponent for nuclear science, believing that Australia should be involved in uranium mining and enrichment, along with nuclear research and power generation. He had played a key role in the establishment of the Lucas Heights reactor. After some negotiating, and using policy work provided by the AAEC, Gorton secured Cabinet approval for the Jervis Bay facility. The Cabinet recommendation also alluded to ‘other special purposes’ and the ‘important long term defence implications’ of the power plant. Tenders were issued and roadwork commenced, with the power plant expected to be operational by 1975. 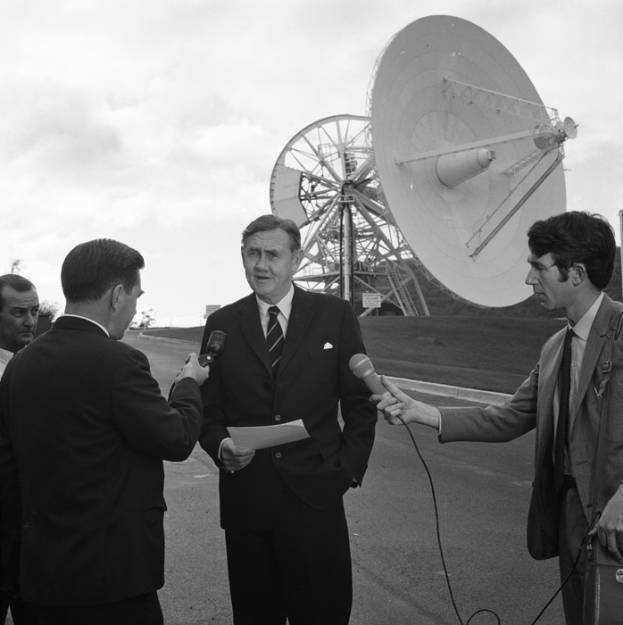 After Gorton lost the leadership in March 1971 momentum stalled and his successor William McMahon cancelled the project on the basis of concerns about the cost, and compatibility with Australia’s Nuclear Non-Proliferation Treaty obligations. Gorton had a natural affinity with the public, and displayed genuine warmth towards them. Before taking up residence at the Lodge, Gorton invited his neighbours to a farewell party at his home in the Canberra suburb of Narrabundah. On occasion, to the dismay of colleagues, he was late to Cabinet meetings because he stopped and chatted to school groups who were visiting Parliament House. Gorton accepted an invitation to attend the Anzac Day service at Ballarat in 1968. He was given the honor of leading the march that included 2000 ex-servicemen. In the group lined up behind him were the captain and crew of the HMAS Ballarat, who had rescued Gorton from the sea after his air crash during the war. The crowd of some 6000 people witnessed Gorton order ‘Parade…quick march’ and ‘Eyes right’ and responded by calling out ‘Good on yer, Jack’ and ‘You little beauty’. In his speech delivered during the service, Gorton reminded the audience that the war provided the chance ‘to create the world we want to see’. Afterwards Gorton moved among the crowd shaking hands and signing autographs for children. After he lost the leadership in 1971, newspapers received letters from voters who were angry that the Liberal Party had removed Gorton. The Malvern Town Hall even hosted a ‘Get Back Gorton’ public meeting. May the high courage and the technical genius which made this achievement possible be so used in the future that mankind will live in a universe in which peace, self-expression, and the chance of dangerous adventure, are available to all.